3 passes above 5000m at once. Thame (hidden transit to Tibet/Bhot). 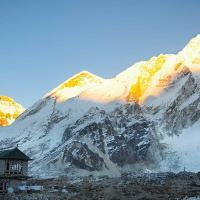 A part of Greater Himalayan Trail, The 3 passes of Everest Region itself has a great idientity. This trek is the real trekkers trek. Miracles of world’s highest mountains with these great 3 passes is the lifetime achievement for any visiters. With these three passes Renjo La (5360m. ), Cho La(5420m), and Kongma La(5535m.). Through these passes, you can see most of the scenario of Everest region. This trek is not only popular for high passes and mountains, it is also popular for the Sherpa culture, monasteries, wildlife, lakes, glaciers and alpine lifestyle of people and plants. Three passes explain you the beauity of the Mt. 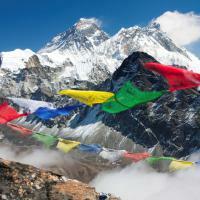 everest, so be ready to absorb breathtaking view. Happy Hari will help to show you thrilling view. Hotel in Kathmandu (2 nights, on arrival and before departure). Domestic Flight to Lukla (both way). All necessary permits (National park fee and TIMS). Tea-house accommodations (all the way). Happy Hari staff will be waiting for you at the airport with our company’s logo printed on the t-shirt and holding a sign with your name. Once you meet the leader you will be warmly welcomed and transferred to your accommodation in Kathmandu which will require approx. half an hour’s drive. After check-in at the hotel and refreshing you will be briefed regarding your tour programme. We take an early morning flight to Lukla. This scenic flight only takes 40 minutes. Lukla itself is a beautiful mountain village. We will have a break for tea or coffee. And you can buy bottled water or trekking gear if you still need anything. After our short break we will trek about 4 hours to Phakding. We will have lunch somewhere along the way. Namche (3440m) - 4 hrs hike. Intrestingly, you are getting more deeper to Sherpa culture and villages through getting higher, this is one of the properitiy of this trek. Thame is one of the popular village of Khumbu region, probably, long time ago this is also one of the Alpine trade route and still on occasionally. So Thame itself has it’s own identity in this region. So, worth to spend overnight, here. Lumde will be perfect place to spend overnight before Renjola Pass. This place has great views of mountains and you can get good chance to chat with Yaks. This is the place to be after high mountain pass, Crystal clear lake of Gokyo where you can sighted some ducks swimming, occasionally and the view of mountains are enough to make this place lifetime delighted. Yes, you deserve rest and acclimatized in this place, there is Gokyo ri (5360m)hill for the acclimatization from where you can absorb the world’s highest mountains. 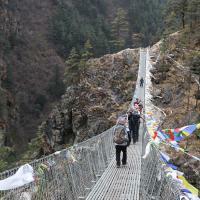 Now, there is short day walk before Cho La pass and Thangnak will be the best place to spend overnight. This 2nd (Cho La 5420m) pass of this trek and Dzongla is the place where you’ll spend overnight. Short day walk will take you to Lobuche, there are few places you can wonder around. View of glacier close from tea-houses also one of the best option you can choose. Gorakship (5140m) - 8 hrs walk. This is the day to reach Everest Base Camp, better to start early morning, so you’ll have enough time to come back at Gorakship for overnight. Huge rocks, rubbles, glaciers, birds will be the great impression or attraction of the day and similarly Everest Base Camp’s scenery itself makes your journey proud. Kalapathhar (5600m),the well-known view point for Everest can climb early morning and same way you came up will take you down to Lobuche. Now ready for final (Khongma La)pass, there are still some part of glacier path to cross before uphill to Khongma La pass and after pass beautiful downhill trail with just in front view of Amadablam will track you down to Dingboche. Dingboche village is probably the highest village with it’s own farming land and people still growing their food and vegetables. Tengboche (3860m) - 4hrs walk. 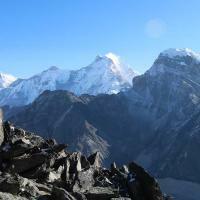 Today, easy trail will lead you to the popular place called Tengboche. The beautiful Tengboche Monastery still serves the view of Everest, Amadablam and so on.. The Bakery of this place is also serve the good coffee and breads. Phakding (2610m) - 7 hrs walk. Now, the enjoyment of low elevation trail easily take you down to the Phakding. Lukla (2840m) - 4 hrs walk. Final day about 4hrs walk will take you to the Lukla. Kathmandu (1350m) - 40 minutes flight. Transfer to the Intl’ Airport as per your schedule.